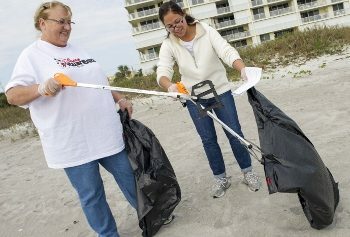 COCOA BEACH, Florida – VoluntEARS from Walt Disney World Resort and Disney Cruise Line demonstrated their commitment to local environmental and conservation efforts today, as they teamed with friends, family and community partners to clear more than 250 pounds of trash along the Brevard coastline near the homeport of Disney Cruise Line. The Walt Disney Company, through the Disney VoluntEARS program, provides opportunities for Cast Members to volunteer their time and expertise to positively impact their communities. Last year,Disney VoluntEARS contributed more than 216,000 hours of service in CentralFlorida. Projects ranged from youth education programs to feeding the homeless to building playgrounds. Environmental efforts have included initiatives from Orlando Nature Preserve and Green UpOrlando. Disney Cruise Line is dedicated to minimizing environmental impact through efforts focused on utilizing new technologies, increasing fuel efficiency, minimizing waste and promoting conservation worldwide. Cast and crew members strive to be positive environmental stewards, and seek to inspire others through programs that engage our guests and communities in our ports of call. Please visit http://dclnews.com/about/environment/ to learn more.